Hitler was the founder of Nazism. Adolf Hitler (20 April 1889 – 30 April 1945) was an Austrian-born German politician. He was the leader and founder of the Nazi Party. He was the chancellor of Germany for the years from 1933 to 1945. He was also the Dictator of the Nazi Germany from 1934 to 1945. Hitler played a prime role in World War II in Europe. Hitler was the son of Alois Hitler and Klara. He married his long-time partner, Eva Braun in 1945. Adolf Hitler was considered a great figure in his days. He was born at the Braunau am Inn, Austria-Hungary, a town on the border with Bavaria, Germany. He attended Volksschule, which was a state-supported school near Fischlham. He was always loyal towards his country, Germany. From his young age itself he had started planning about the development of German nationalist ideas. Hitler joined the German Workers' Party in 1919 and became the leader of the National Socialist German Workers Party (NSDAP) in 1921. He gained popular support by attacking the Treaty of Versailles and promoting Pan-Germanism, anti-semitism, and anti-communism with Nazi propaganda. He was appointed as a chancellor in 1933. His aim was to establish the Nazi party, and rule over the world. Under Hitler's rule, in 1941 German forces and their European allies occupied most of Europe and North Africa. 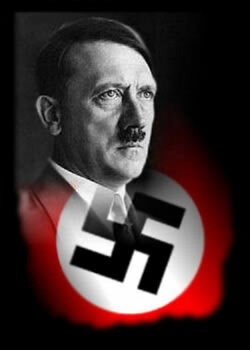 His aggressive policies were considered to be the primary cause of the World War II in Europe. He started racial discrimination towards the Jews, and considered them inferior; due to which majority of Jews were killed during his time. He was the one who had fought a strategic war and did treaties to bring almost the entire Europe under Nazism. Majority of the countries who were involved in the World War II attacked Germany together. Hitler and his wife committed suicide on 30th April, 1945.